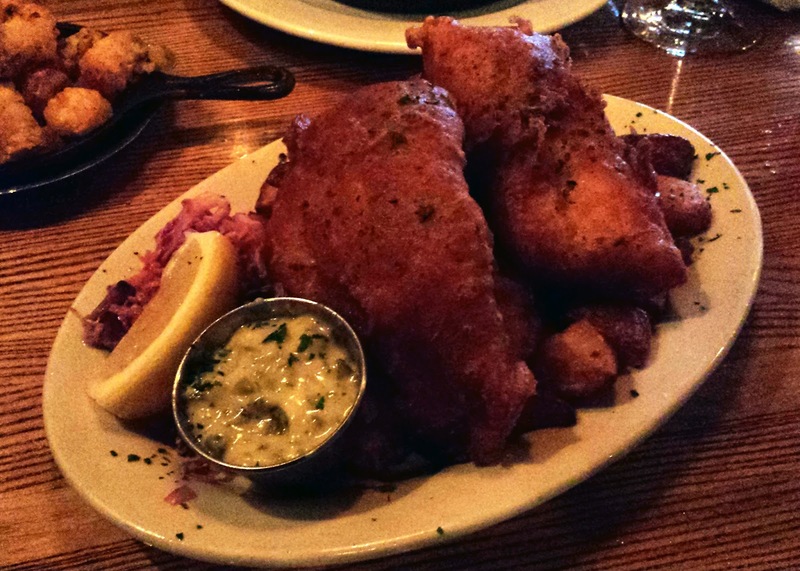 For my first night in Newport Rhode Island, the Wharf Pub and Restaurant provided me with exactly what I needed; a relaxed setting, good music, friendly staff and some great fish and chips. The food here was very good but not overthought with large (for me) portions and attractive plating’s that really make you want to dig right in. The beer list was massive, loaded with local beers from RI, MA and VT, and left me feeling a bit lost. However our waitress was more than ready to make a suggestion that proved enjoyable throughout the evening. 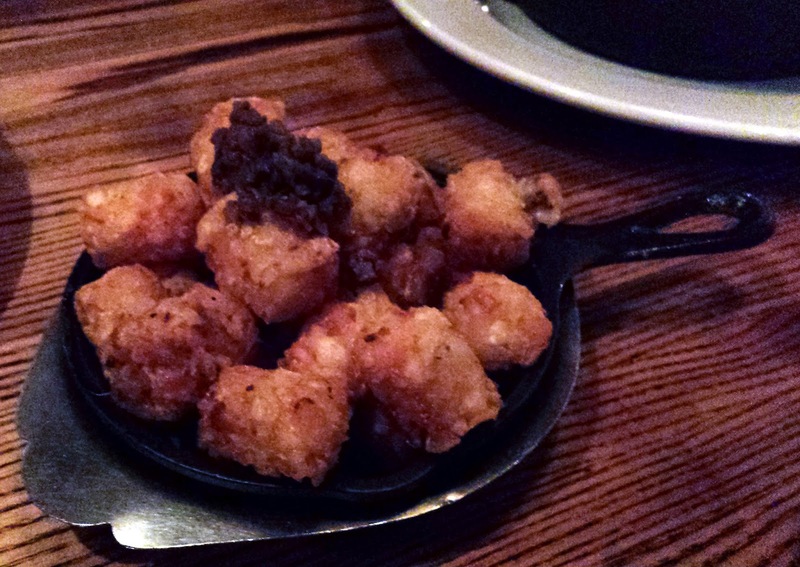 I started with a simple salad, while picking at a well laid out cheese and charcuterie platter, but what really stood out was a plate of tater tots (yes-tater tots) with anchovy butter. The Wharf pub has a list of different tater tot combinations that you can choose from and they all looked very appealing. As for the entrée, the fish and chips really caught my eye. Fresh cod battered and fried, over a mountain of potatoes (that would have taken me two meals to finish) and the house made tartar sauce. It was excellent and exactly what I needed on my first night in this seaside town. Along with a glass of Sam Adams “Grumpy Monk”, a Belgium inspired IPA, I was all set for a night on the wharf. 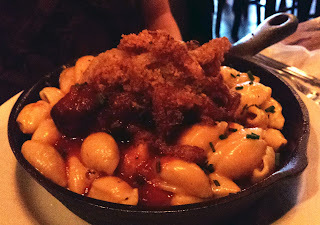 Another dish of considerable note was the pork shoulder mac and cheese. You can’t eat like this often, but when on vacation (or for once in a blue moon), you must treat yourself to a dish like this. As if the pork shoulder and mac and cheese weren’t enough, a pile of batter-fried onions resided on top, to truly cap off your hedonistic wet dreams. It was plated beautifully in a cast iron pan, giving it the perfect rustic appeal. As a lover of an occasional Cassoulet, this dish rang all the right bells. Moving on with our evening, we found ourselves at a bar, grill and lounge named, The Fifth Element. Having just finished with the satiating cuisine at The Wharf Pub, I wasn’t in a mood to eat. However, what I did find at the Fifth Element, were a number of great whiskies to choose from. For a few months now, I’ve had my eye on a bottle of the Glenmorangie Signet (having come highly recommended by a friend), yet I never pulled the trigger. Imagine how happy I was to see a bottle residing at the bar in the Fifth Element. It was a beautiful glass of Scotch: undeniably rich and spicy, with smooth warm wood tones, espresso, a hint of citrus and dark chocolate. It literally danced on the palate, with a finish that seemed to go on and on. I will be buying a bottle. From there I moved on to a glass of the 15-year Yoichi, again a whisky that I’ve heard a lot of about but haven’t tasted. It was gorgeous, holding it’s own, but hard to follow the Signet. There was a big part of me that loved it, for being “correct”, but not unique or inspiriting. I found myself using the word soulless, which was truly too harsh. The fact is, I enjoyed it and would never turn down glass—I guess I just wanted my first Japanese whisky to be an ah-ha moment. So ended my first night in Newport, I can’t imagine a better way to have spent it. Todays addition may just be a quick note, but it's well worth your time. The wine's of Massican have inspired me on more than one occasion. 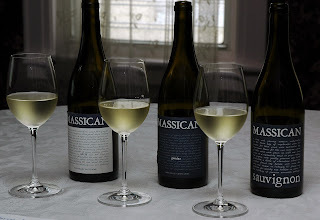 With an introduction to the wines in 2010 with, Massican: Passion in a Bottle, to a detailed food and wine pairing piece in 2011: "Is it Napa or Fruli? Neither. It's Massican". Each vintage I've been impressed by these wines. 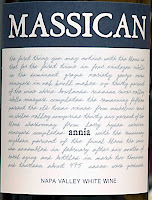 And now, having just tasted the 2012 Massican Annia, I think this is the best vintage--for this wine--to date. a quick recap for those not familiar with these wines, Massican is a project headed up by Dan Petroski (the assistant winemaker at Larkmead Vineyards). His wines find a very Italian profile in the soils of Napa Valley. 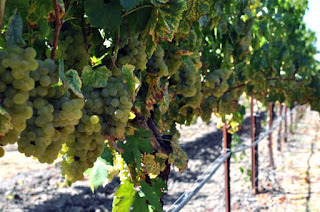 They are well defined with great acidity and focused fruit. In a blind tasting, you would easily believe these to be one of the best wines from Friuli or Alto-Adige. This year the Annia is a blend of 46% Ribolla Gialla, 36% Tocai Friulano and 18% Chardonnay. If you're a lover of Italian whites, this is a wine you must try. 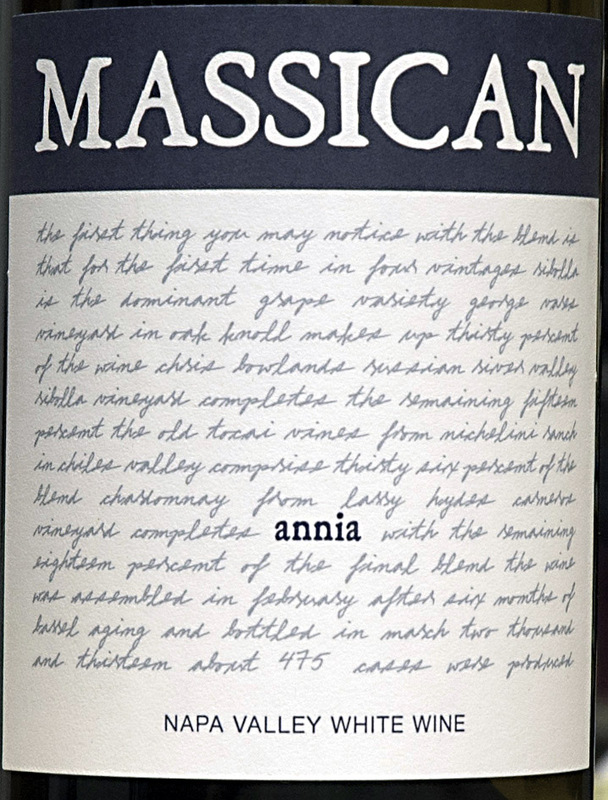 2012 Massican Annia - The nose of the 2012 Annia was simply gorgeous, with lime infused wet rock, backed by floral undergrowth, notes of peach skin and almond that came forward with time in the glass. On the palate, I found a level of intensity that, in the past, required an extra year in the cellar for Massican, yet it was here on the first pour. Still incredibly vibrant with teaming green apple acidity that made the mouth water, showcasing ripe pit fruits, weighty textures and a bitter twang that lasted through the refreshing finish. As much as i'm enjoying this now, I'm sure it will continue to improve due to it's impeccable balance. It's going to be hard not to drink them all this summer. (93 points) Find it on : Wine-Searcher!